I’m often amazed, shocked, confused or amused by perfume advertising. For instance, Parfum d’Empire’s Eau de Gloire pays homage to the great warmonger-plunderer-egomaniac Napoléon Bonaparte; and its latest fragrance release, Fougère Bengale, celebrates the pompous tiger hunts of colonial India. 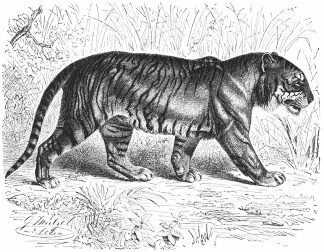 Before the early part of the 20th century, (truly glorious) Bengal tigers were not endangered; but even if you feel it was acceptable to slaughter hundreds, thousands, of magnificent animals for “sport” (or for body parts used in folk medicines), tiger hunts devastated local economies in India. As huge maharajah-led or British-sponsored hunting expeditions traveled through the Indian countryside — elephants, horses, carriages and marching men damaged farmlands and woodlands. To feed the large numbers of men, women and animals traveling in the procession, provisions and livestock were cheaply bought (or stolen outright) in villages along the route; the tiger-hunting parties often left hunger and poverty in their wake. Fougère Bengale contains lavender, tarragon, patchouli, geranium, tobacco, tonka bean and vanilla. Fougère Bengale starts with a blast of rich green-herbal notes; you can smell lavender, but its floral aspect is masked by ‘greens.’ The green notes quickly ‘dry’ and a straw-honey-uric accord emerges (has the Bengal tiger marked his territory?) Fougère Bengale transitions from the honeyed and patchouli-tinged straw note into a cured tobacco leaf aroma (the scent of a freshly opened package of cigarettes). The mellow tobacco note lasts a good while on my skin and endures into the vanillic, slightly powdery, warm and cozy dry down. Tom at Perfume Smellin’ Things noted a resemblance between Fougère Bengale and Annick Goutal’s Sables, and I agree with him. I’ve owned two 100 ml bottles of Sables and used every drop, but if Fougère Bengale had been around, I would not have bought my second bottle of Sables. Fougère Bengale, on my skin, has more complexity and clarity than Sables (which can stall in its development and send out unvarying wafts of immortelle, and can turn bitter and murky during the dry down). Other reviewers have mentioned the presence of “maple syrup” and “gingerbread” accords in Fougère Bengale; the fragrance does have a sweet base, and perhaps even a driblet of immortelle, but my nose doesn’t detect anything distinctly foody. Parfum d'Empire Fougère Bengale is a ‘whispery’ fragrance that stays close to the body; its lasting power is good (6 hours on my skin) if applied liberally. Fougère Bengale is $130 for 100 ml Eau de Parfum; for buying information, see the listing for Parfum d'Empire under Perfume Houses. As for my mini-rant about Parfum d’Empire and Bengal tiger hunts? No doubt, many of you want to shake me, or toss a glass of cold water in my face, and say: “This is perfume — not a rifle! Get a grip!” I’m not angry with Parfum d’Empire or its creator, Marc-Antoine Corticchiato; I’m world weary. It’s 2007; Bengal tigers and their habitat are disappearing; and there are still large numbers of people on this earth who believe eating a teaspoonful of crushed tiger bones will make them “tiger-like” and cure their ailments, but who are too ignorant to realize their “need” for such “products” leads to the extinction of what they prize and emulate — tigers. I wish Parfum d’Empire had left the word “hunt” out of Fougère Bengale’s ad copy; otherwise Fougère Bengale is perfect as-is. Note: first image by Gustav Mützel, via Wikipedia. I perfectly understand your irritation about this marketing – seems a little bit out of time. I'm wondering whether the myth of hunting tigers is actually appealing to the modern urban man – and am not sure about it. Perhaps more than I do imagine? Your description of the scent sounds lovely, though. I know what you mean Kevin. Let the past be the past and let us learn from the terrible mistakes and miscalculations that were then made. I don't feel any affinity with this kind of marketing. Glorifying the times of empires and emperors gives this fragrance a false elitist aura. Linaria: yes, I DO like this fragrance…well worth trying if you enjoy fougere scents. I think a lot of us get wrapped up in “imagery” from the past if that imagery is beautifully presented…deeper (and perhaps NEGATIVE) meanings aren't necessarily “noticed” at first, and that's understandable in this fast-paced world. The world of advertising is STRANGE…. Marianne: even Parfum d'Empire refers to Napoleon as a DICTATOR in its ad copy! HA! I have no desire to shake you or throw cold water on you — I've had exactly the same thoughts, only you expressed them so much better than I would have. The scent, I have to say, sounds lovely, and I want to try it. And in the spirit of full disclosure, I must add that I own a Hermes Napoleon scarf, and I have always felt a little bit ambivalent about it! But I love David's image of the guy on the rearing horse. Although apparently, Napoleon actually made the schlep through the Great St. Bernard Pass on a mule. Like it or not but in the time of Napoleon Bonaparte 'Eau de Cologne 4711' was a very famous fragrance. Annunziata: since you've come clean: I TOO had a crush on Napoleon as a child…read every biography I could find at my library…and even wanted a mini-bust of him for my room! It took reaching high school age to get past the pomp and drama and dashing images and realize the true/complex story of his life. Enjoy your scarf…I don't think many people you run into will give it a second thought! Annunziata, I don't think that Hermes will ever make scarves with mules on them Enjoy your scarf, it's certainly very beautiful. But 4711 was and is more about medicine than about Empire. Mmm. I'm looking forward to trying this, both because of your review and because of its provocative inspiration. I find that perfumes that are created with a very specific concept or totally obscure inspiration are often the best. The idea of a perfume based on colonial tiger hunts? Oh wow, how could I NOT try that? That someone spent time meticulously putting together a blend that evokes the grandeur and greed of the time and the event is a real selling point for me. Now I want to try it to see if it does indeed accomplish its goal. Hmm, I do love a good fougère, and this has been on my radar since its launch. I've almost ordered a sample several times, only to be distracted by something else. I do find the Parfum d'Empire concept a bit odd, but still more interesting and digestible than some of the even more odd concepts, like, say, Etat Libre d'Orange. I like the idea of Sherman's March — smoky wood, magnolia, and gardenia could be really great together! Haha. Green Lavender? Geranium? Patch? Tonka? I'm almost ready to say 'sign me up' until we get to the tobacco — I still need some intense tutelage in Tobacco Appreciation, I'm afraid. Joe: I can't believe your COLDNESS to tobacco notes! If you really dislike tobacco so much, I'd say don't bother with Fougere Bengale…there IS a tobacco-y stage in its development. Kevin, isn't it funny, the Napoleon stage? For me it came in between Nancy Drew and Nathanael West. Oh, I've said too much today. But yes, he has been wrapped in glamor, beyond recognition really. Marianne – you're very kind, and it's so true — although Hermes' artists would probably create a beautiful mule! Excellent review! I have a sample of this that I've not tried yet; perhaps this will be the weekend. On my crabbier days, I sometimes wish perfumes were all in easy to use, plain glass atomizers, so that I could get past bottle appearance & marketing ploys and just truly focus on SMELL. For me, scent is a major life enhancer, like music or delicious food, and it irritates me when I allow marketing to get in the way. On the other hand, sometimes the beautiful bottle or clever ad campaign add a lot to the experience. I try not to pay too much attention to the hype that surrounds some scents, whether that hype is from the perfumer or the consumer. Rosarita: I can forgive almost any ideas or images or techniques swirling around the creation of a scent (except torture, death and destruction!) if, in the end, it smells good. Let me know how you like FB. this line is so thick on hype and thin on delivery i have completely written it off. that and i found the first offerings too derivative. your review gives yet another compelling reason to ignore the line. Don't get me started on perfume copy – it's a semiotic minefield from the first oriental onwards. I'm with you K on the tiger issue, but this gets no more opprobrium from me than Cuir Ottoman or Ambre Russe or MKKor Yatagan – blood sweat and tears of culture and all that. Love the smell though. And it's pretty damn animalic on me. Minette: Pd'E scents are not what I'd describe as “original” or “cutting edge” — that being said, I do enjoy some of them and they hit the spot on days I DON'T want to be that original or cutting edge myself…but I've not bought an entire bottle of one of their fragrances yet. Lee: very true: all those swords, conquests, EMPIRE-building stuff. I really get an “animal” stage mid-development with Fougere Bengale…and enjoy that section a lot. Wonderful read! Fascinating point of view, too. I spent years writing for an ad agency, so the provocative language is a way to get attention. Not to demean the public, but there is probably a lot of romance and romantic derring-do ideas about the time of the British expansion. But Fourgere Bengale was meant (according to the description at Lucky Scent) to honor the Mongol Empire (Approx.1200-1400), which, quite frankly, wasn't exactly a picnic in the hay field, either. Empire also has Iskander, a perfume that celebrates Alexander the Great, known to the Thebes and Persians as 'Alexander the Destroyer.' The other perfume, Osmanthus, celebrates a time that women had their feet cruelly bound to be beautiful for their men, while crippling them for life. And while we're at it, Lubin has that African mask, and Africa was horribly exploited and is in a political shambles today. And isn't it Tom Ford has those bizarre ads that demean the men AND women of today? The list is pretty long is we look at perfume that way. The frag. is interesting, although it has a distinct spicy-cumin phase to it, right before the hay part, and I for one, will be happy when cumin is retired as a perfume component. Cumin and I are fine gustatorially, but we just don't get along in a fragrance. But it's an interesting mix, and quite wearable in a scent-marking kind of way. Lucky Scent have unfortunately conflated the Mongols with the Moghuls, which just goes to show what's happened to history nowadays: one Asian culture from a different place and time can easily stand in for another. I did send them a pedant's email correcting their misprision – it was, it seems, soundly ignored. quinncreative: true: it is astounding, the ideas/figures ad people/perfume companies place front and center these days…I wonder if the majority of them know anything substantial about art/culture/history? (they CAN reference “things” like HBO's “Rome” — where history is taken for a ride.) Better to chuckle I guess, and move on! L: well, you gave it a try! I noticed that when I was writing this review and thought: “There's only so much I can fit into one review!” Maybe they used BabelFish to translate the Parfum d'Empire ad copy…scary! Well, I'm happy to discover I'm not the only one to have had a barely pubescent (or was that “pre”) crush on Napoleon, which I find quite embarrassing now. 1/ Fougère Bengale does seem a bit derivative to me, as do most of the very well-composed Parfums d'Empire: a drier, lighter-handed Sables with lashes of Eau Noire. Cuir Ottoman's name was practically lifted from Cuir Mauresque, Ambre Russe from Ambre Sultan. 2/ The “empire” type marketing almost certainly sprung from the perfumer's Corsican origins. Start with Bonaparte, end up with Gengis Khan… Not the most palatable associations. That said, the Fougère Bengale sample is still on the top of the heap for further comparisons with Eau Noire and Sables in view of a purchase. What an interesting viewpoint! I totally agree, and I am quite a lover of tigers myself. It does seem that it is a very strange way to market a fragrance – or maybe they think their intended audience is only superrich people who care nothing for these things? I have a bunch of Parfum d'Empire samples and just tried Eau Sauve (The Empress Josephine scent) for the first time today. I just LOVE it! I am going to get a sample of Fougere Bengale to try. I, too, had a fascination with Josephine & Napoleon…still do. Or, at least that era…. The PC: I still like Josephine…a great lover of flowers, PUGS, and gardens (and ungrateful skin-flints)!. Flora: no doubt most people don't pay as much attention to niche perfume ad copy as I do..HA! I sympathize with the world weariness. it is a bad world but never so bad that you cannot address it as you do so admirably here.